Our son, David, was a Phoenix Police Officer who was killed in the line of duty on May 19, 2016. These last 8 months have been the most difficult and painful time of my life. One of the ways God has comforted me is through this truth – ” A person’s days are determined; you have decreed the number of his months and have set limits he cannot exceed.” Job 14:5. God has already decided which day will be the last day of your life here on earth and mine. I could spend a lifetime searching for wisdom – trying to understand. But I would never find it. Because I’m not going to find it on TV or the Internet. Twitter and Facebook will not help me grow wise. Human knowledge does not bring wisdom. S0 – where do wisdom and understanding come from? “God understands the way to it and he alone knows where it dwells”. This fear means to respect God and submit to his will. Respecting God and obeying him makes me wise. Turning away from evil and avoiding it brings me understanding. I don’t have to look any farther than my relationship with God to find wisdom and understanding. 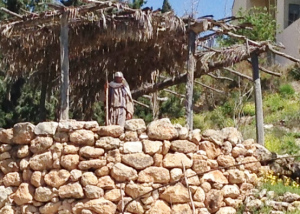 I love how clearly God speaks about these very important items…..
On my trip to Israel earlier this year, we visited a Nazareth village which is set up to show us what Nazareth looked like when Jesus lived there. A watchman was placed high on the hill overlooking the village and the land surrounding it. Ezekiel explains the watchman’s duties in his 33rd chapter. He says the watchman needs to blow the trumpet to warn the people when he sees danger coming. If he blows the trumpet and the people don’t heed the warning, they are responsible for their own deaths. BUT, if the watchman sees the danger coming and doesn’t blow the trumpet, the watchman is responsible for their deaths. We don’t have watchmen……or, do we? We definitely have danger all around us. As we read about King David’s death, it reminds me of one of my favorite blogs from last year right after I got back from my pilgrimage to Israel. King David’s tomb was there with whatever remains of him. 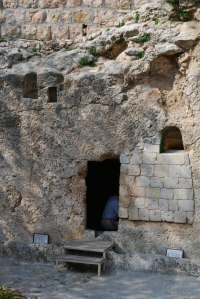 Jesus’ remains weren’t there – because he’s alive! 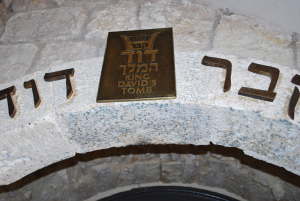 On my recent trip to Israel, we visited King David’s Tomb. 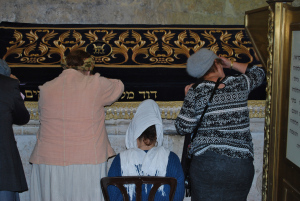 There were women there, praying as they leaned on the cover of his tomb. The atmosphere was very quiet and respectful. It was a dark, somber place. Men covered their heads as they went down the other side of the hall which led to the tomb and the women walked down the other side behind the divider. Whatever remains of King David after these thousands of years was there. What a sharp contrast our visit to the Garden Tomb which is believed to be where Jesus was buried. We saw the beautiful garden which is mentioned in John 19 and we saw the empty tomb. The garden was sunny. The flowers bloomed. It was an oasis of peace and calm in the center of noisy, crowded, tension-filled Jerusalem. There must be a ‘must’ behind all of this. The current head of the National Institutes of Health, Francis S. Collins, came to faith after he set out to disprove God. A geneticist, Collins was appointed director of the $3 billion international Genome Project in 1993, which completed sequencing the 3.3 billion pairs of nucleotides by 2004. The resulting gene map offers hope to cure genetic disorders. It also gave Collins a spectacular view into the magnificence, order, and finely-tune perfection of the DNA molecule, God’s software for every living thing. Directorship of the Genome Project was touted as the most prestigious job in science at the time. Do we find it when our To-Do lists are done? When we have some extra money in our bank account? 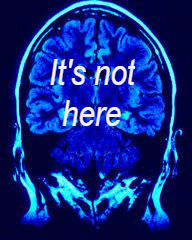 Do we really ever find peace from the thoughts…..
swirling around in our heads? The prophet Micah tells us that Jesus is our peace. I always find it amazing that, over 700 years before Jesus was born, Micah and Isaiah prophesied so clearly and so accurately with so many details about the Messiah. In Micah 5, we read that the Messiah would be born in Bethlehem. There is very little peace in Bethlehem these days. 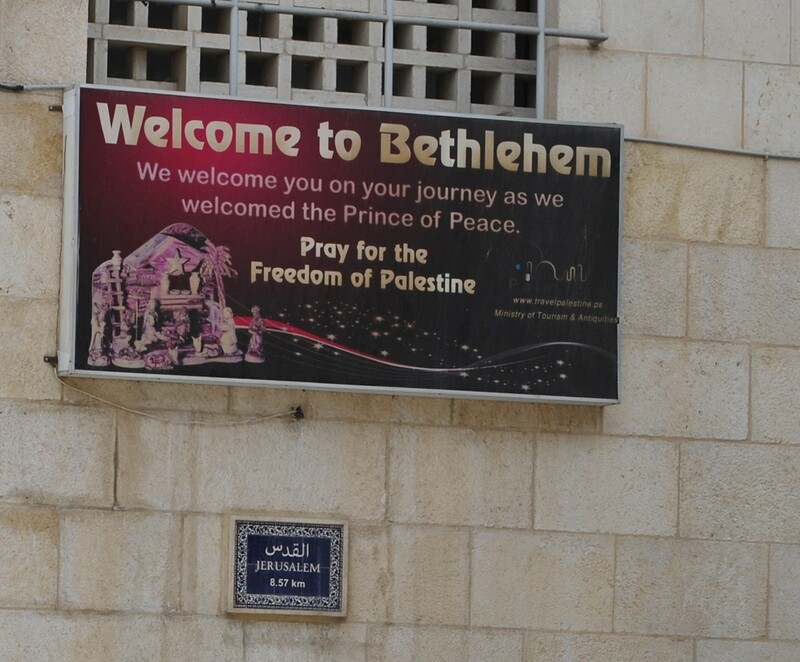 On my recent visit to Israel, one of the shopkeepers in Bethlehem asked us to pray for freedom for Bethlehem. It is a very depressed and oppressed city. Micah also told us that the Messiah would be a shepherd who would care for his flock with his strength and majesty. The Messiah’s flock would be secure because of his great power over all the earth. And Micah tells us the Messiah would bring us peace. Please give us your peace, dear Jesus. I praise him with all that I am! I will praise the Lord until the day I die. 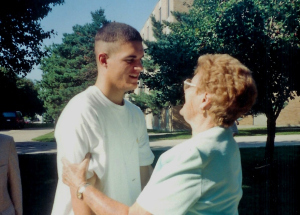 I’ll be singing praises to him for as long as I live….here and in heaven. We can’t put our trust in people – they can’t save us. When they die, their lives are over, all of their plans are done. When we trust in God, we are blessed. He is our only hope. God is the creator of everything and he will be faithful to us forever. He cares about those who are held down and held back by others. He feeds the hungry. The Lord sets us free. He helps us to recognize what is true. The Lord helps those who are weighed down by problems and sadness. The Lord loves those who live their lives according to his directions. The Lord cares for those who don’t belong anywhere. He is a father to the fatherless and a husband to widows. He purposely messes up the plans of those who listen to the whispers of the Evil One. 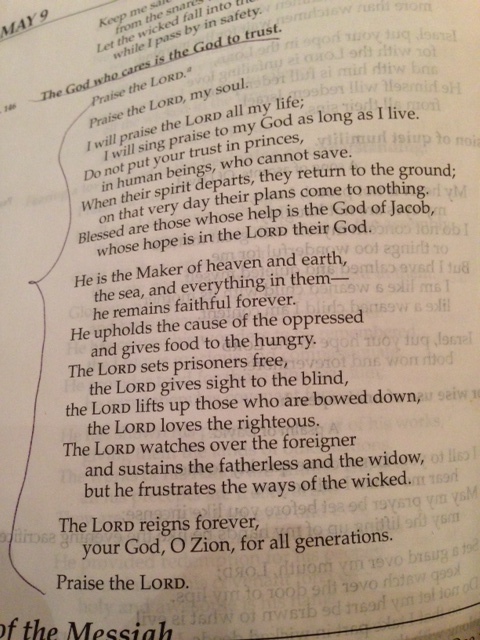 The Lord will be our King forever! For all generations! 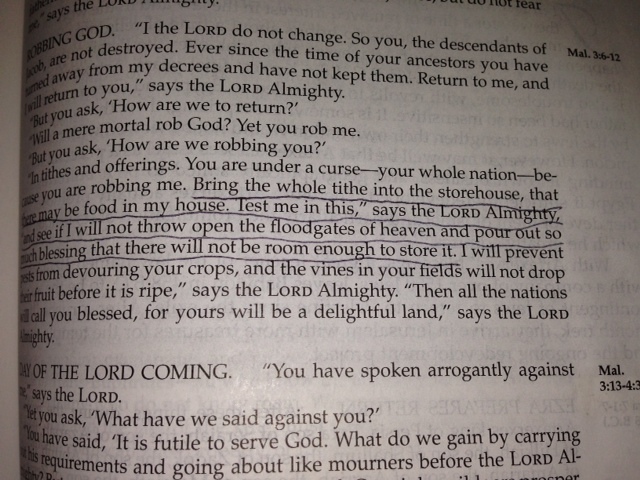 God tells us in Malachi 3 that, when we bring our whole tithe to him, he will throw open the floodgates of heaven and pour out so much blessing that there won’t be enough room to store it. If you have, then I’m sure you’ve experienced the same thing that the rest of us who have done this have experienced. God always keeps his word. The blessings start rolling in, pouring out and multiplying. Sometimes its actual money – an unexpected check, rebate or promotion. Most of the time the blessings are things that money just can’t buy. Things like joy, contentment, improved relationships with family and friends, a clear sense of direction and purpose. And there’s an additional blessing of knowing that we are handling our finances in a way that honors and pleases God. This is the only place in the Bible where God challenges us to test him. He knows that it’s so easy for us to want to be in control of our money – even when it’s clear that we’re really messing it up. Money can quickly become the god we are slaves to as the debt rises and the god of ‘more’ takes control. God doesn’t want that for us. He wants us to live a life filled with joy and freedom – freedom to serve him. We can’t do that when we’re slaves to money. So he challenges us to let him take control. Because he loves us and he wants the best for us. I am always inspired by Queen Esther’s story. Lots of drama, lots of intrigue but she listens to her Godly Uncle and responds to God’s call upon her life. God’s calls us to use the gifts and talents he has given us to meet a need in the world around us. It’s true for all of us who love God. When I was younger, I thought only pastors and missionaries received a calling from God. I’m not sure where I got that from because it’s clear throughout the Bible that God calls each believer to faithfully respond to him with a ‘yes’ and fill a need around them. Its not a vague, general calling – he has a specific need all picked out. And it’s now. For such a time as this. God makes us aware of it at just the right time. If we’re listening. If we’re watching what’s going on around us. If we’re meditating on his word. But there’a always a purpose for us. When we have nothing else to do here, God brings us home to heaven. If we’re still breathing, we have a calling, a purpose, something planned out by God for us to do.